Tomorrow morning, way too early, I’ll be leaving for the picturesque town of Wacken in the north of Germany to attend the Wacken Open Air festival. I’ll probably be back the third of august and recovered the fourth. I’m having trouble with the wireless on my 3G iPhone. Either an action works perfectly (for instance downloading e-mail or visiting a website), or it will just time-out. I just jailbroke it and installed sshd. ssh-ing to my it via 3G miraculously works perfectly. However, when connecting to it via WiFi it’ll simply refuse data. That is, until you let the iPhone try to get data itself by for instance visiting a website. Then suddenly the ssh packets come through again. In the background (with screen) I’m running a very frequent ping to my local gateway which makes ssh work perfectly again via WiFi. A very unsatisfying hack. It seems like an aggressive power safe on the WiFi. On the day of release, I bought an iPhone. We all know the great features; thus let’s talk about the annoyances. It crashes and gets sluggish a lot. Especially Safari crashes a lot and the contact list at one moment took 10 seconds to get responsive. Over time random crashes in all applications appeared. Rebooting it, actually, seems to have solved it (for now). Wifi is unreliable. Sitting right next to the router it’s still a game of chance whether it will load a website properly or just time-out. This often leaves me disabling Wifi, and using HSDPA instead (which is our 3G), which has a terrible coverage. Outside reception is great, but even inside a building near a window, it only shows one or two “pips”. This again, often leaves me disabling 3G in favor of the (slower) but the more reliable GRPS (?). T-Mobile in the Netherlands seems to have trouble with the administration of all new subscriptions. Billing information and visual voicemail still don’t work. The software I use to render those great graphs might be of interest to some. Instead of using a clumsy GUI or an inflexible graph language, I use a Python library called PyX which is able to generate beautiful graphs. At its core it’s a generator for TeX, and rendering graphs is just one thing it does well! Take a look at the examples and convince yourself! To make more sense of the logarithmic nature of the graph, I’ve added three lines. The first (solid black) indicates the points of which both sizes are equal. 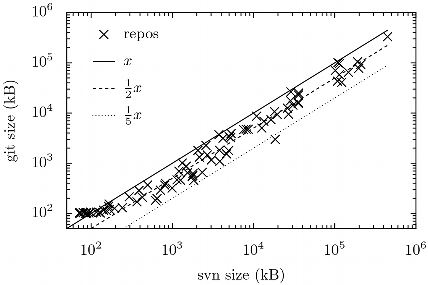 The second course dashed line indicates the points of which the subversion repository is twice as large as the git repository. And lastly, the third finely dashed line indicates the points of which the subversion repository is five times as large as the git repository. All projects for which git is less storage efficient, are smaller than 100Kb. The projects for which git is most storage efficient (up to even 6 times for a certain C# project), are all of medium size (10–100MB) and code-heavy. For the other projects, which are blob heavy (eg. images), git and subversion are close (git beats svn by ~20%). One notable disadvantage of huge (someone committed a livecd image) git repositories, is an apparent memory usage of git repack even if I tell it not to with --window-memory.